"...pass on to the Parkes people that their labour was not in vain, they've given us the best TV yet." This report is the web version of a refereed paper in the scientific journal "Publications of the Astronomical Society of Australia"
The paper was received on 1 February 2001, and accepted on 1 July 2001. Full reference should be made to it when citing any part of this report. To obtain a hard copy of the article (PASA Volume 18, Number 3) click here to get a PDF version or a PS version. First Updated: December 2001. Latest Update: 25 February 2009. It was one giant leap for mankind, and it was taken at 12.56 pm Australian Eastern Standard Time (AEST) on Monday 21 July 1969. Six hundred million people, or one fifth of mankind at the time, watched Neil Armstrong's first steps on the Moon. Three tracking stations were receiving the signals simultaneously. They were CSIRO's Parkes Radio Telescope, the Honeysuckle Creek tracking station outside Canberra, and NASA's Goldstone station in California. The signals were relayed to Mission Control at Houston. During the first few minutes of the broadcast, NASA alternated between the signals from its two stations at Goldstone and Honeysuckle Creek, searching for the best quality images. When they switched to the Parkes pictures, they were of such superior quality, that NASA remained with the Parkes TV pictures for the remainder of the 21/2-hour telecast. 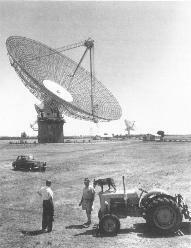 Photo CSIRO: The Parkes Telescope as it appeared in the early 1960's. In late 1968 NASA had asked for Parkes to be used in the Apollo 11 mission. The giant telescope would be the prime receiving station for the reception of telemetry and TV from the surface of the Moon. Using it also provided extra gain in signal strength from the Moon. This meant that during the tightly scheduled first moonwalk the astronauts would not have to spend time setting up a large antenna to get the necessary signal strength. The then Director of the Parkes Observatory, John Bolton, insisted on a one-line contract with NASA: "The [CSIRO] Radiophysics Division would agree to support the Apollo 11 mission". At 6:17 a.m. (AEST) on 21 July, astronauts Neil Armstrong and Edwin (Buzz) Aldrin landed their LM, Eagle, on the Sea of Tranquillity. It was still some seven hours before the Moon would have risen high enough to be seen from Parkes. The schedule required the astronauts to rest before attempting the moonwalk, by which time the Moon would have been high overhead at Parkes. However, Armstrong departed from the original plan, opting for an immediate moonwalk instead. To the astronomers at Parkes, it looked as though the moonwalk would be all over before the Moon even rose over Parkes. However, it took the astronauts such a long time to don their spacesuits and depressurise the LM cabin that as they left the module the Moon was just rising over Parkes. It seemed as though they would get the signals after all. But suddenly troubled loomed. While fully tipped over waiting for the Moon to rise, the telescope was struck by a series of severe, 110 km per hour gusts of wind, which made the control room shudder. The telescope was slammed back against its zenith axis gears. This was a dangerous situation, threatening the integrity of the telescope structure. Fortunately, cool heads prevailed, and as the winds abated, Buzz Aldrin activated the TV camera just as the Moon rose into the telescope's field of view, and tracking began. Using a less sensitive 'off-axis' detector, Parkes was able to receive the TV pictures just as the LM TV camera was switched on. Less than nine minutes later the Moon had risen into the field of view of the Parkes telescope's main detector. Because Parkes was a larger telescope, it captured more signal and so produced better pictures. Houston switched to Parkes and remained with those pictures for the rest of the 21/2-hour broadcast. Parkes staffer Neil 'Fox' Mason, who was seated at the control desk, drove the telescope without being allowed to once turn around and see the incoming pictures on the TV monitor. It was essential for him to monitor the tracking of the telescope, in case the winds picked up again, threatening the signal reception. The weather remained bad at Parkes, with the telescope operating well outside safety limits for the entire duration of the moonwalk. The signals were sent to Sydney via specially installed microwave links. From there the TV signal was split. One signal went to the Australian Broadcasting Commission (ABC) studios at Gore Hill for distribution to Australian television networks. The other went to Houston for inclusion in the international telecast. Because the international broadcast signal had to travel halfway around the world from Sydney to Houston via the INTELSAT geostationary communications satellite over the Pacific Ocean, a 300 millisecond delay was introduced to the signal. Australian audiences therefore witnessed the moonwalk, and Armstrong's historic first step, some 0.3 seconds before the rest of the world. 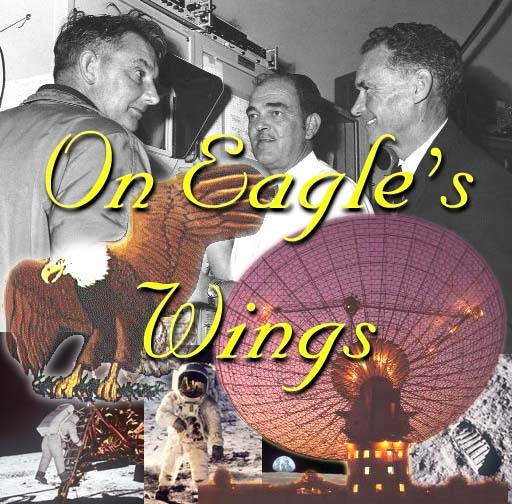 This report endeavours to explain the circumstances of the Parkes Observatory's support of the Apollo 11 mission. The success of the support was a result of the dedication and professionalism of the CSIRO and NASA staff at the observatory, and of the technicians and workers of Australia's communication network, notably from the Post Master General's office (PMG), the Overseas Telecommunications Commission (OTC), the Australian Broadcasting Commission (ABC), and the Australian Department of Supply.